Genea-Musings: Amanuensis Monday - Post 310: 1798 Deed of Amos Plimpton et.al to Harman Guild in Norfolk County, Mass. Amanuensis Monday - Post 310: 1798 Deed of Amos Plimpton et.al to Harman Guild in Norfolk County, Mass. The subject today is the 1798 land deed of Amos and Mary (Guild) Plimpton and other heirs of Nathaniel Guild (1712-1796) to Harman Guild in Norfolk County, Massachusetts. 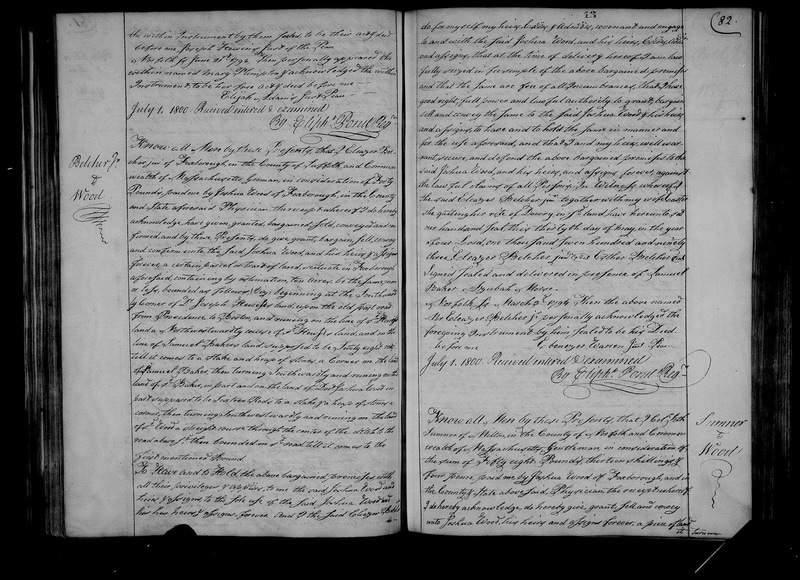 "Massachusetts, Land Records, 1620-1986," digital images, Church of Jesus Christ of Latter-Day Saints, FamilySearch (https://familysearch.org : accessed 4 March 2016), Norfolk County, Mass., Volume 13, pages 81-82, deed for land in Norfolk County from heirs of Nathaniel Guild to Harman Guild, 1798; citing original records in County Courthouses, and on FHL Microfilms. 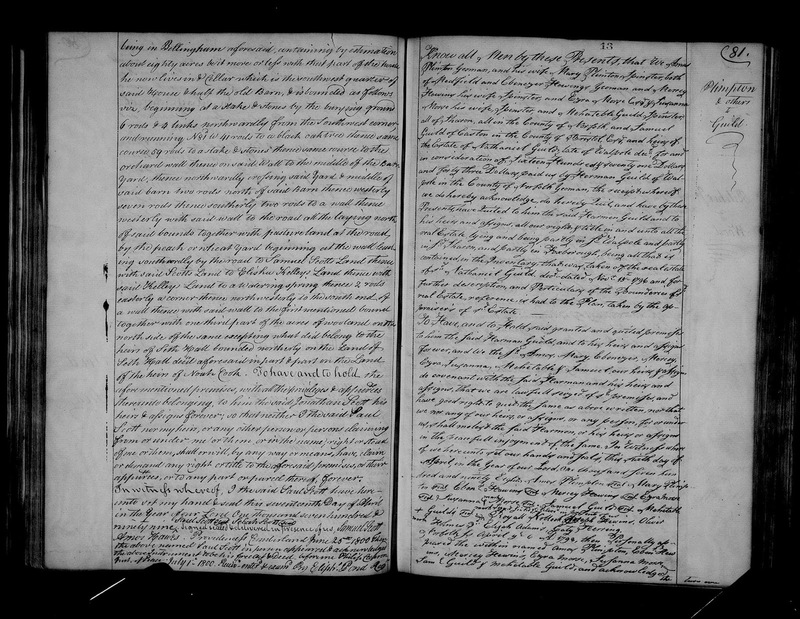 The grantors of this deed are the heirs of Nathaniel Guild (1712-1796) of Walpole, Massachusetts; they are Amos Plimpton and his wife Mary (Guild) Plimpton of Medfield; Ebenezer and Mercy (Guild) Hewins of Sharon; Ezra and Susanna (Guild) Morse of Sharon; Samuel Guild of Easton; and Mehitable Guild of Sharon. The land was all of the real estate owned by Nathaniel Guild, as described in the inventory in his probate records, comprising about 88 acres in Walpole, Foxborough and Sharon. The five named heirs of Nathaniel Guild were to receive $1,671.43 from Harman Guild, or about $334 each. Nathaniel and Mary (Boyden) Guild are my 6th great-grandparents, and Amos and Mary (Guild) Plimpton are my 5th great-grandparents. I am descended from their daughter, Mercy Plimpton, who married Aaron Smith.